Noise pollution is a noise that goes beyond the normal noise level to where it is no longer reasonable or acceptable, whether the noise is produced by a human, animal or some type of machine or equipment. Noise pollution can be an environmental nuisance that overexposes someone to a sound exceeding his or her tolerance level or disrupts the normal activity of human or animal life. Not only can noise pollution impact human health, but it can also cause stress among wildlife by interfering with their natural habitat and sounds of communication. Light pollution pertains to light that intrudes on a natural setting, such as obscuring the stars at night, or excessive light such as lighting that extends beyond a property line leading to discomfort and nuisance. Excessive lighting can create glares that have a blinding effect thereby creating a potential hazard or can disrupt normal daily activity like sleep patterns. In the natural environment, excessive lighting can obscure the night sky or alter the ecosystem by introducing light in normally shaded areas. Such lighting can be disruptive to land and marine animals as they migrate or nest. I don't think there should be another light put up in this city that is not dark sky friendly. The light dome that surrounds Winston Salem is horrible. And a plan should be put into place that would begin to replace all the street lights with downward pointing light. The way the lights are now I sure hope the pilots need the light cause it is doing nothing to help the people on the ground see, in fact it really causes people to be able to see less. The neighborhood i live in is a great example of light pollution. They installed the acorn lights and because they are basically useless for lighting they have to put one every 10 to 15 feet. so now you can read a book out front, and i need light darkening curtains to be able to sleep in the front bedrooms. Light pollution should be addressed via ordinances. Light fixtures should not be allowed that allow light above the horizontal, that means FULL cutoff lighting. Ordinances should address light trespass, where light from one property shines across property lines and affects the quality of life of neighbors. Streetlights are some of our worst light pollutors, along with unneeded decorative uplight on buildings. Human beings need periods of both light and dark to function effectively. Too much lighting at night interrupts our natural circadian rhythms, leading to disruption of many of our bodily processes. Recent research has now begun to link overlighting to disease states such as cancers and even obesity via the disruption of these natural rhythms. Animal and plants are affected too: nocternal pollinators are being attracted to lights and being killed by them. Nocternal animals have a harder time finding prey and birds are confused by night lighting and fly into buildings, with tragic consequences. The dome of light ( think wasted energy, wasted natural resources, wasted tax dollars)that shines up into the sky above our cities limits our ability to see the stars, a tragic loss of a wonderful part of our natural heritage. Streetlighting should be minimal in residential areas and should not shine onto properties. Bright high pressure sodium bulbs have no place in residential areas. Dawn to dusk security lighting should be outlawed and replaced with security lighting on motion sensors, so that it is only on when it is needed. More light does not mean more security. Often it only serves to illuminate the path for wrongdoers. Light that shines into your eyes at night causes glare and reduces your ability to see by shutting down your pupils. 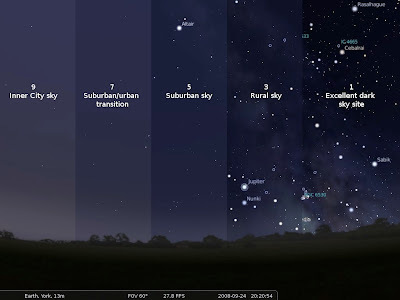 Light pollution is a type of pollution that can be reversed by good quality lighting fixtures and not misdirecting light( shining it up or horizontal). I agree; light pollution steals the beautiful starry skies that belong to us and our children. And smart lighting is both efficient and less costly. There's really no down side, no down side at all, to using smart lighting - except that some business people will feel like their rights to draw attention to their businesses is being impinged upon, and that's more important to them than the public good. But if the rules are the same for everyone, then they should have no fear of working within those constraints. WOW! I am glad to see some other people are into not having your night all lit up. I moved here from a northern urban area, to rural forsyth county. I saw more stars up there than I ever do here. All the neighbors have the flood lights in the yards. What's with that? I can see the glow of WS from 12 miles away. when there is cloud cover, there is so much reflection I can read by the ambient light. I'd rather see the stars. How about a light ordinance? Or at least guidance...although guidance usually doesn't do jack. As long as the city keeps taking Duke Energy's suggestions for streetlighting little progress will be made in reducing the too bright lighting. Power companies make money off selling cities too bright lighting and try to make them believe people want more light. What I want is a neighborhood dark enough to fall asleep in without having to block my windows from intrusive streetlighting. Power companies do not want to sell lower wattage bulbs...they will not make as much money. There were several comments on light pollution at the Environmental Movie night. People really do care that we are wasting natural resources and tax dollars to use electricity to shine light up into the sky and destroy our view of the stars. Light pollution also makes for an unsightly nighttime environment on land and causes problems for humans, animals and plants, ALL which need periods of darkness. Light pollution is a tremendous waste of tax dollars that could be used to benefit people. Ordinances should require that businesses cut off lights after they close and that decorative lights on buildings are cut off after 10 pm. Get full cutoff streetlights, not semi-cutoffs that allow light to go 5% above horizontal. these allow light trespass. Reduce lighting levels in residential areas for the health of our residents.